Hope everyone has had/is having/will have a great holiday and new year! We spent today with some of JD’s family, and are spending tomorrow with some of Dusty’s and the cats are wondering why we can’t just stay home ALL weekend and feed them delicious things and play with them. After all, isn’t this the season of giving? Speaking of giving– we know we’ve been neglecting you folks a bit and our page output has been admittedly lagging. Aside from the holidays we’ve been going through some rough family stuff that’s set us back a bit, but we’ll be returning next week with a new page and hopefully a more stable schedule starting with the new year. Wish us luck!! In the mean time, have this to tide you over. 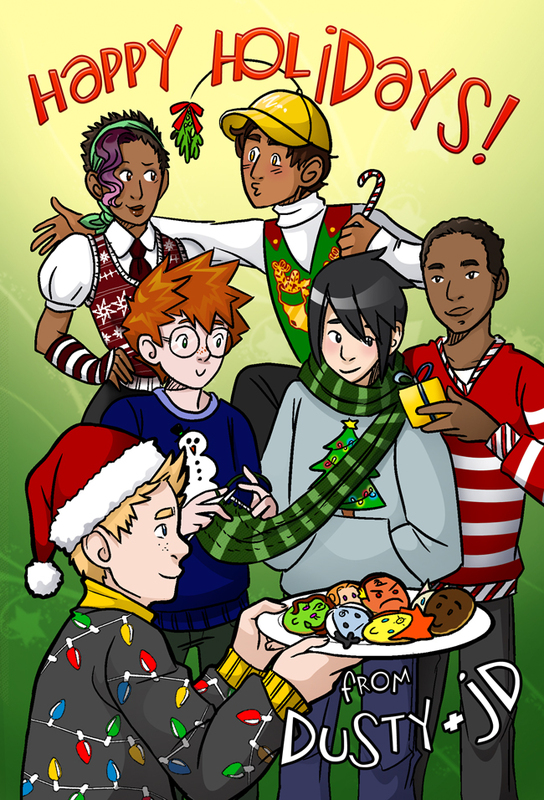 It’s the front of our holiday postcards which are on their way to most of you (not including a few stragglers that’ll probably go out between now and New Year’s). Now get off the internet and go put on that ugly Christmas sweater grandma got you last year before she decides you hate her. Aww I love this picture.Happy Holidays! Gaw the cookies are adorable. Thanks for the great comic story. Good luck in the new year! I like how the one kid is knitting the scarf while it is already being worn. Hope family stuff works out! THE FACE ON AUTUMN’S COOKIE… AWESOMENESS. I just started reading your comic a couple days ago and I love it! It quickly has become my favorite webcomic! It’s so unique and uh… what I was going to say sounded so much better in my head when I was in the shower… I hope everyone works out. Don’t worry about not being able to update as often, it’s understandable. Love the pic and Merry Christmas and Happy Other Holidays I can’t think of right now! Yay, got my card in the mail today! 😀 Thanks guys! I just got mine in the mail the other day! Yay!!! Just got my postcard today, thnx so much, looks great. Wow, I hadn’t realized from looking at the smaller postcard version that the cookies were of the seasonal spirits. Mike’s Christmas tree lights-patterned sweatshirt(?) is also a nice touch. Happy new year guys! I’ve been (admittedly not very patiently) waiting for my postcard, hope my parents didn’t throw it out… Still excited for it though!